Some delightful nut who calls herself “The Horse Tailor” actually crafts geeky costumes for horses, clearly with no regard for the nobility of those animals. Or for intellectual property rights, for that matter. Behold the Batman costume. And a horse whose spirit has been broken. * Unverified. I am not a lawyer. 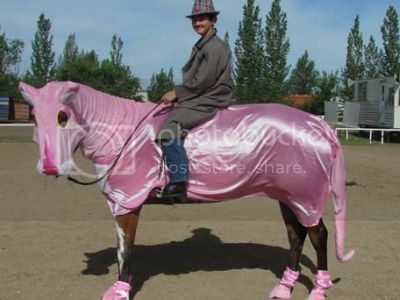 Hate to break it to you- but costume classes are fairly common at horse shows and tons of fun. 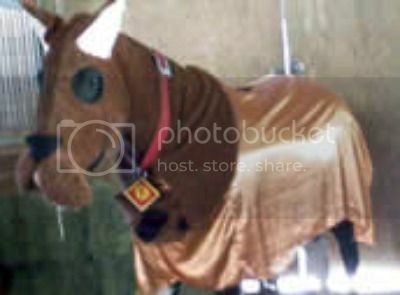 The Horse Tailor’s costumes look to just be nicely crafted coolers and wraps- things the horse shouldn’t mind in the slightest with any handling. The only time I’ve ever had a horse throw a hissy fit over a costume was when *I* was wearing a dress, he didn’t mind his wig and hat. Of course, just like the fact that you get Slave Leias in all sizes, so, too do you get Belly Dancer-esque costumed women on Arabian horses at these things…. Is anyone else worried about the fact that Dumbledore is riding Harry Potter? No…true horse geekiness is the horse hairdresser. He/she/it (not sure on any account) styles horse manes a la human. 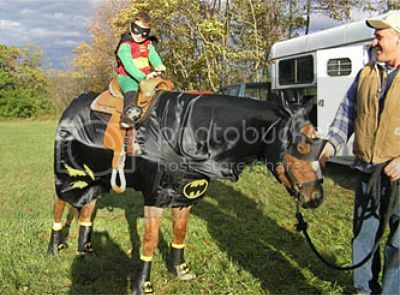 Scary, geeky, and I hope they don’t give the horse a mirror. 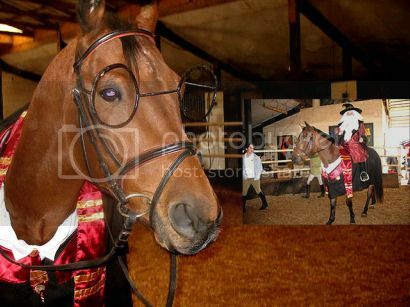 Actually, now I want a horse just so I can make it wear glasses. Not a whole costume, just maybe some horn-rims. I never knew it was a possibility before, so I never cared to own a horse. I’ll definitely be asking Santa for one this year.